When I’m checking my doors and windows before going to bed at night or nervously looking over my shoulder on the way back to my car. 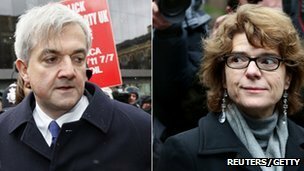 Am I frightened I might bump into either Chris Huhne or Vicky Pryce. No. Why catch criminals when you can pick on people you can criminalise instead. Come off it. They are criminals. There are worse – murderers, rapists, arsonists, robbers – but they are still criminals. They criminalised themselves. It’s very sad, but that’s how it is. She wanted her revenge and she got it, and it has cost her. What you could say, sisterhood, could apply to all non-violent offenders, couldn’t it? Do you really mean that the criminal process and imprisonment is not for “decent people” like these two? Imprisoning them serves no purpose at all and it is a waste of money. The system of fining drivers for speeding has never been about speeding, or even a deterrent, it is entirely about revenue generation. A documentary following one these mobile speeding cameras revealed a frustrated operative complaining because drivers were slowing down to 40 mph in 60 mph zone when they saw his van. He was complaining because they were SLOWING down. Speed wasn’t the issue but his inability to “catch” anyone no number plates equals no revenue. What Chris Huhne did was stupid. He asked Vicky to take his points. Who of us hasn’t done something utterly unbelievably dumb in the course of lives with or without criminal consequences. It’s the speeding points system which needs reform. Chris should have considered behaving more honorably when he met his new partner and left his wife for her. Yes she would have felt the anger and betrayal we would expect but not the need for vengeance. This mess is entirely his own and utterly avoidable. He should have kept his points, should have behaved less caddishly and finally owned up right from the start. Do I think these two flawed, but intrinsically decent, people should be behind bars. No. They are not career criminals there is nothing to be gained from this except the legal two fingered salute that’s been meted.